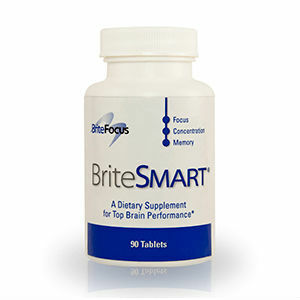 My review for today is the supplement BriteSMART from BriteFocus. This product claims to improve overall brain health as well as specific facets such as: memory, focus, function, and energy. BriteSMART is a dietary supplement in tablet form. Now, we take a more detailed look at BriteSMART from BriteFocus, so keep reading to find out more about this product. The number of tablets that come in a bottle of BriteSMART is 90. The recommended dosage for this particular product is 3 per day. This is the dosage recommendation for adults. There is no dosage recommendation for children as this product is geared toward adults, older adults especially. Each tablet should be taken with a meal, so breakfast, lunch, and dinner are the ideal times to take BriteSMART. According to the FDA’s Daily Value nutrition information, BriteSMART contains 125% of the daily value of biotin. The Ceretrophin daily value has not been determined. Research shows the active ingredients and active compounds (Ceretrophin) are presented in sufficient amounts to be effective if the product does indeed work as claimed. There are some possible side effects with BriteSMART, although it is an all-natural product. These side effects come in the form of interactions with people who have certain mental disorders or who are on medications for certain mental disorders such as dementia, bipolar disorder, epilepsy, and hemophilia. There could be potential complications in women who are nursing or pregnant. Therefore, usage of BriteSMART by pregnant or nursing women is highly discouraged. For one 90-tablet (a 30-day supply) of BriteSMART, the cost will be $69.95. However, it is possible to get $10 off of each bottle of BriteSMART. In order to get this discount, you will have to enroll in a monthly auto-ship plan. This means you will have to provide a credit card, and you will be automatically billed and shipped a new bottle every month until you cancel. So, if you are enrolled in the auto-ship program, each bottle will cost you $59.95. BriteFocus, the company behind BriteSMART, does offer a guarantee. BriteFocus says of their guarantee that if you are not completely satisfied, you will receive a full refund of the purchase price without question, after you return the unused portion in the bottle in which it was shipped. However, it does not say anything about a time limit. BriteFocus simply says they will refund the purchase price upon return of the remaining unused product. Thus far, there have been no other customer reviews found in research. From the information that I have gathered, it would appear that BriteSMART is a decent supplement in order to promote overall brain health and performance. Another plus of this product is that it is all-natural, rather than chemicals. The cons to this product is the pretty vague guarantee, as there are almost certainly conditions in order to receive a refund. It is also difficult to measure one’s brain health and performance before or after taking BriteSMART in order to evaluate its effectiveness. Providing that BriteFocus honors their guarantee, there is nothing lost in trying it out to see if it works. Henry Costa	reviewed BriteFocus BriteSMART	on November 20th	 and gave it a rating of 3.